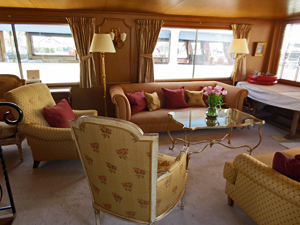 BELMOND AMARYLLIS is an ultra deluxe 8-passenger barge cruise, meticulously decorated with a mixture of contemporary and antique Louis XVI and XV furniture. Luxury, comfort and relaxation abound on board, from the large suites with roomy bathrooms to the elegant lounge, deck and dining area. 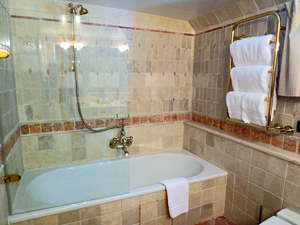 Take a plunge in the heated pool for the ultimate barging experience. Linger over meals cooked by the cordon bleu chef, and enjoy a cruise that traverses two canals and a day on the River Saone. An alternate route between Dijon and Vandenesse on the Burgundy Canal is available on select weeks. 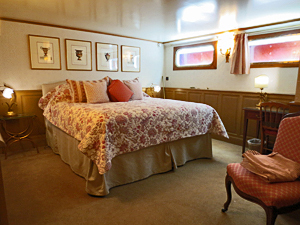 This cruise is ideal for those who love beautiful surroundings and appreciate luxurious accommodations and service on one of the top barges on the waterways of France. 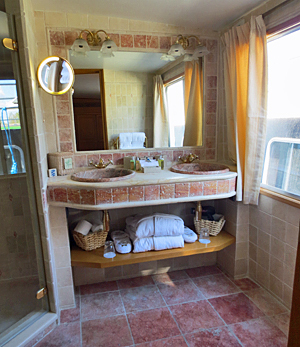 All barge amenities including bicycles, swimming pool on deck, music system, library, etc. Family, Golf, Grand Cru Wine Appreciation, Wine Academy and Custom Cruises upon request. Board the barge at St Leger-sur-Dheune for your cruise through Burgundy. A champagne reception welcomes you on board and gives you a chance to meet the crew. Later that evening, enjoy your first dining experience on board. 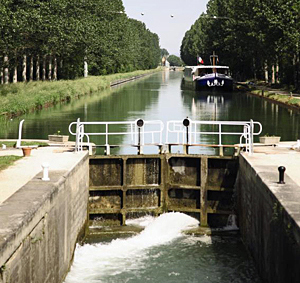 A leisurely cruise on the Canal du Centre gives you a chance to savor the beauty of the French countryside, with plenty of opportunities at the many locks to get off the barge and walk or cycle along the splendid tow path. 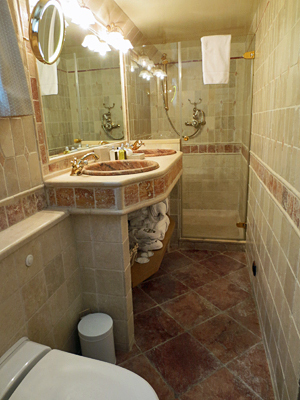 Later, your guide takes you to Couches for a tour of the magnificent privately owned Château de Marguerite de Bourgogne dating from the 12th and 15th centuries and harboring some medieval Burgundian secrets! Relax on board while the barge cruises the final section of the Canal du Centre before entering the last and very deep lock into the River Saône just north of Chalon-sur-Saône. The scenery changes from the close proximity of the canal banks to the expanse of this beautiful river. This afternoon enjoy a walking tour of Chalon with its quaint antique shops, stunning cathedral square and half timbered buildings. There is free time to enjoy the fine shops, or perhaps just to sit in one of the numerous sidewalk cafes and watch the world go by. A somewhat different cruising experience today, through the lovely valley of the River Saône to the town of Seurre. Lunch will be taken at the beautiful Levernois estate near Beaune before we visit this charming old town to see the famous Hotel-Dieu, a magnificent 15th century charity hospital, followed by a private wine tasting. There is time to stroll through the old town taking in the wonderful architecture and fine shopping. Tonight's mooring is at St Jean-de-Losne, the barging capital of France. Take some time to stroll around the ports and see the many working barges and house boats that are moored here. This morning the barge leaves the river and enters the Burgundy Canal. Enjoy the chance to walk or cycle along the towpath. After a wonderful lunch on board we visit the historic Clos de Vougeot where the Cistercian monks first began making wine in the 12th century. The ancient chateau is now the headquarters of the celebrated Burgundian wine society the, Confrererie des chevaliers de tastevin, and contains the ancient cellar and wine presses from medieval times. Rejoin the barge in the countryside near Longecourt,the overnight mooring. Today your guide takes you on a walking tour of Dijon to visit the market, Ducal Palace, the Grey Poupon mustard shop and enjoy some shopping at the covered food market. Tonight, the barge moors in the port of Dijon. As the chef prepares for your Farewell gala dinner on board, perhaps try a 'Kir' aperitif; a cocktail which mixes the locally produced Cassis blackcurrent liqueur with the area's Aligoté white wine. After breakfast, disembark the barge for your transfer to Paris. ​No reviews available at this time.